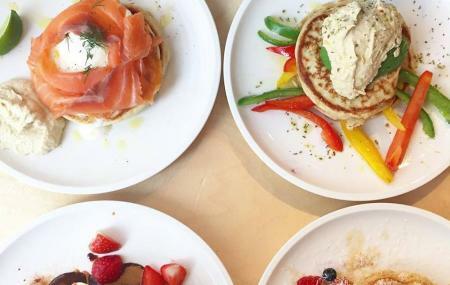 Looking for a place where you can get to try some delectable and innovative pancakes while on your visit to Amsterdam? MOOK Pancakes with all that it has to offer would be an ideal choice. They began in 2016 with the simple philosophy of offering great food and the juiciest juices. They have that mellow urban vibe and use organic wholegrain spelt flour as well as fresh veggies and fruits which is what makes their pancakes so healthy. The variety of pancakes available at MOOK Pancakes is pretty extensive and the juices are made from the freshest ingredients for that yummy taste. Very tasty pancakes and nice lively atmosphere. The cappuccino sadly was quite lacking. It came from a machine and wasn't worth the 2.50, so pick something else for a drink. One of the few places to get American style pancakes in Amsterdam. 5 stars for the food, but I love coffee so 4 stars overall. Best pancakes ever! I got pancakes with chocolate, strawberries, banana and an apple juice and ginger shot. All of the ingredients were so fresh and tasty and the staff were super friendly. The vibe in there was so lovely and relaxed and the decor was fab. A must visit. Cozy, hip atmosphere. Various choice of pancakes and fresh drinks. I haven't try many pancake restaurant yet. But I can say it was the best pancake restaurant I've ever been to, till now. The pancakes here are amazing! The tea is fresh and they have a nice assortment of fresh juices. The staff is really cool, they have great music and the feel of the restaurant is great, its very well decorated and has a lot of plants along with sky lighting. Absolutely stunning! The food is delicious and the staff are friendly. The atmosphere is very homey and you can definitely get some Instagram worthy shots there :DD. This is the perfect breakfast spot!